" I've been to bakeries with fewer cookies. " It's one off-handed line, it's clever enough as a quip, and describing what's going on in/with a computer in a natural way in any non-interactive fiction can be a pain. But all the same, oy. John Allison's "Giant Days" did a cleverer, more natural-sounding variant a while ago. "Do you just sneeze right onto the screen?!" "I give it a bath on its birthday." I love the artwork. Though I don't know much about the new Iron Man. 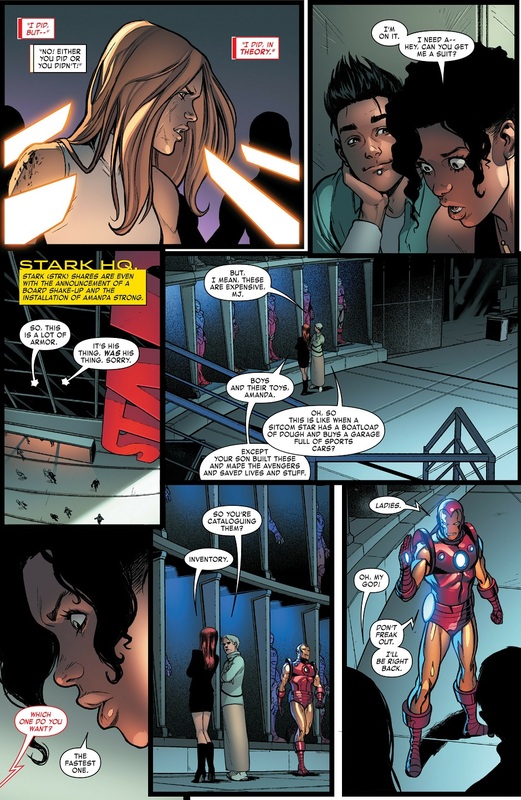 From what I've seen, it doesn't look like her suit is much different from Tony's, and her personality seems rather generic. Which is a real shame, as I'd love to see her be more of a mad scientist type, considering she's a mechanical genius in her own right who constructed her own suit. 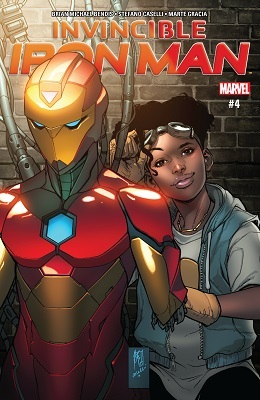 Riri's new armour is pretty much just Tony's most recent armour. There are a few differences (other than it being sized to fit a teenaged girl instead of an adult man), but no more than you would get from normal artist to artist variations of the same suit. As to her personality, she is a little bland thus far. 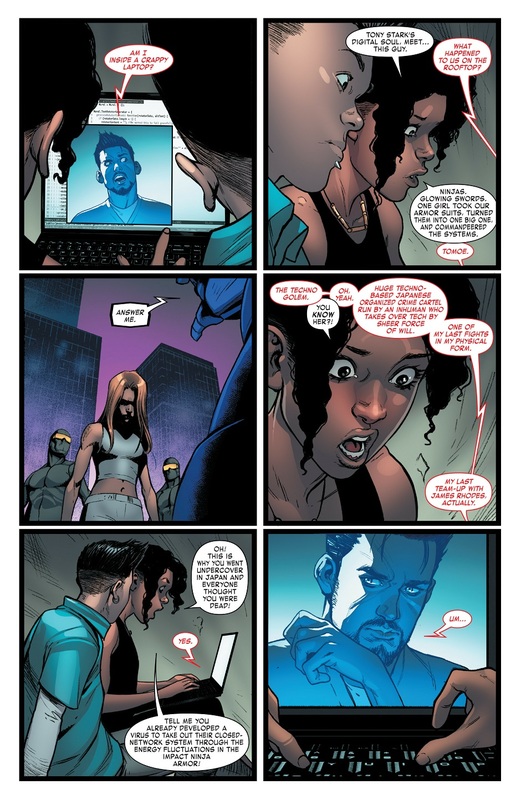 Most of the fun character moments are coming from AI Tony and other people reacting to real Tony being out of the picture for now. But they've given her a solid character foundation to build on, so I'm willing to give them more time to develop Riri into an interesting character in her own right. 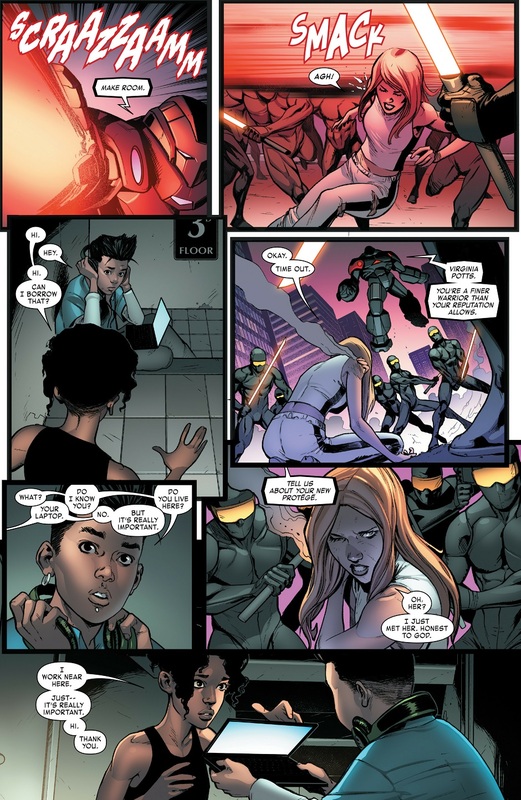 Especially since that while she's definitely the star now, they're clearly setting the groundwork for her to become part of Tony's extended cast when he inevitably returns ( e.g giving her her own codename). It's a much nicer take than the "this new one's the real hero now and you're a whiny loser fanboy if you prefer the old one" method that so many legacy replacement heroes get. How were Pepper and Riri holding their own against ninjas? Neither is empowered, and I don't think either have advanced martial training in their skill sets. Now I'm reminded of the Ninja scene in the Speed Racer movie. I would expect Pepper would have had SOME training by this point. Just by virtue of being Tony's assistant for years and many of the folks she's worked with over time. Oh, absolutely. I totally buy that Pepper could beat the crap out of normal people. But with all the up-teen things she handles, I doubt she'd have time to squeeze in extensive martial training. And now she's up against dozens of people who have had that time and that training. Well, maybe she had martial arts infused into her brain, Matrix-style. I suppose that works. *Last Panel* Love it! The armor I remember as a kid. Bob Layton's art made me a big fan of this armor.